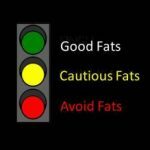 Fats can be very confusing to teach because there are so many different types; some that are good, some that are bad, and some that are downright ugly for your health and body. I wanted to teach my students about the different types of fats in an interactive and simplistic way. So, below you will find ways to teach about fats which can be used as is or easily be adapted for use in an interactive note book. In addition, you will find a lab incorporating a healthy fat that also ties directly into the advice of MyPlate, encouraging the consumption of seafood.